Examine five different types of student loans and what sets them apart. Federal Stafford Loans are awarded based on financial need. Regulated by the federal government, these loans can be acquired from banks, credit unions or directly from the federal government itself. Subsidized Federal Stafford Loans are some of more popular tools used to help pay for a college education. They are long-term and based upon need. They carry a low-interest rate and are subsidized in that the government will pay loan interest while students are in school or if a deferment request is made. An Unsubsidized Stafford Loan is another long-term loan that is not based on need. Unsubsidized means that the loan interest will be the responsibility of the borrower as opposed to the government, as is the case with a subsidized loan. In some cases, it is possible to postpone payments. These loans carry a low-interest rate and are best for students who don't qualify for other financial aid. They are also good for those who still need more aide money to cover expenses. Just about all households will qualify. Additional Unsubsidized Stafford Loans are for borrowers classified as independent students under Federal guidelines. Federal Plus Loans are for parents whose children attend college in full or half-time undergraduate situations. Awarded based on credit history and attendance cost, the interest rates are low. Repayment generally begins within 60 to 90 days upon full loan disbursement or after students graduate. These loans are usually used to help absorb remaining college costs after other kinds of financial aid are used since the maximum loan amounts and interest rates can be applied to both undergraduate and graduate studies, on a Direct Loan or other repayment terms. Federal Perkins Loans are some of the most desirable for both undergraduate and graduate studies. Awarded based on extreme financial need, they have very low interest rates and total funds for disbursement is limited. This means that the loan amount will also be low. The interest is designed to start to accrue nine months after students drop below half-time enrollment or graduate. These loans are reported to credit bureaus, so late payments and defaults are documented and have the potential to damage credit. Private lenders offer a variety of loan products that are based on prime interest rates. Designed to be competitive, it is advisable to shop around to get the best rates. 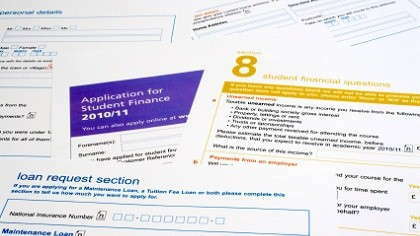 Banks and loan companies usually offer their student loans at lower interest rates. Each financial institution is different. Be sure to understand all of the terms and conditions for every loan before you commit to anything.